This edited volume will be an important and key resource for managers, researchers, and policy makers in the field of Higher Education and Further Education. It offers insights into a radical new way of organizing post-compulsory education on an international basis that directly promotes a social justice agenda (i.e., widening of student participation). Around the world post-compulsory education is divided between Universities and Community-based Colleges. Universities are typically concerned with "higher" education, while community based colleges focus on "further" and technical education. In response to a range of social and economic forces there has been a growth in the number of dual sector institutions (or "duals") that span this divide. 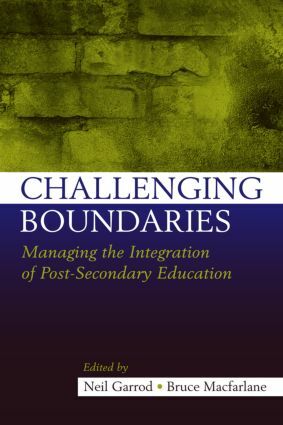 Challenging Boundaries brings together leading international thinkers, policy analysts, academic managers, and researchers who question whether duals can provide relevant education to students and appropriate graduates for the economy, while also offering greater opportunities to disadvantaged students. Challenging Boundaries provides an analysis of the potential of "dual sector" institutions in North America, UK, South Africa, and Australasia. Further and Higher: A Philosophical Divide? Canada: What's in a Title?